Quinta Soñada (rough translation: 'Dreamy little Farm') situated on a gorgeous beach steps from the house. We are on a point of land with miles of beaches either side of us. Your upstairs bedroom is only 50 yards from the ocean, on the Golfo Dulce in the spectacular Osa Peninsula. The house rental includes a 2 story house and private cabin next to the house with private bathroom. The nightly rate is $150/night for 2 persons and $10/person above that. Our house is a comfortable beach house with an open plan to let the breezes cool the house. We offer high quality linens, towels, bug nets and provide a fully equipped kitchen with service for 8. We have an iPhone compliant stereo as well as games and yoga mats. The fully equipped kitchen has a refrigerator, stove, blender,ice chest for day excursions, most everything you might need. The upstairs beds have reading lights and personal fans. There are 2 baths and 6-7 beds total. Our hot water shower has a great view of the ocean. 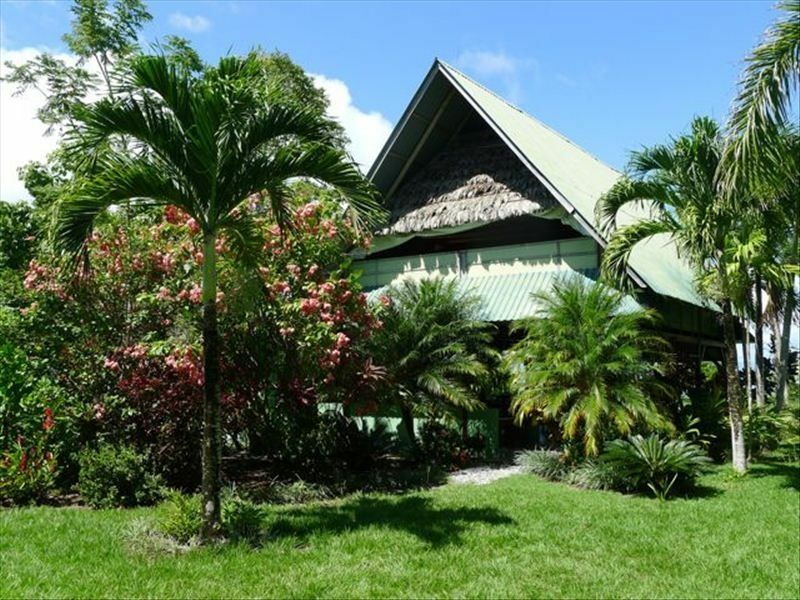 We are 2 miles from the tip of Matapalo Point, and 8 miles to the airport in Puerto Jimenez.Over 8 acres of gardens surround the house. Our home is rustic and tranquil offering a quieter experience away from the road unlike the Matapalo homes just up the way. From the upstairs bedroom you have an ocean view of the Pacific and across the Golfo Dulce to the mountains of Panama. Scarlet Macaws and Toucans come most mornings to feed on our plentiful fruit trees.Our house is powered by the sun (Photovoltaic power) and cooled by offshore winds. You can use the house as a base to explore Corcovado National Park, or Drake Bay. Some folks like to fish or surf the Golfo Dulce. And some folks even take short trips to Panama. Others prefer to not ever leave the property. We are available to help arrange whatever side trips you have planned. Our caretakers can assist you while there. The Osa Peninsula contains one of the last outposts of unspoiled coastal jungle. Corcovado Park is quite close, as are world class fishing and bird watching. We can pick you up at the airport and have available if you choose, on-site taxi, a knowledgeable guide, hearty meals,and laundry service. You may find a highlight of your trip is getting to know your wonderful Costa Rican host family. Or, if you prefer, you can relax at the house in complete solitude. Many honeymoons & weddings (5), have occurred here- ...very good for a beginning OR a renewal. '....'The house is open, Costa Rica rustic, but clean and tidy, with exquisite materials and workmanship. It is clear a lot of labor and love have gone into making this a dream spot. We loved the elevated bed allowing for beautiful morning views of the sea and daily Scarlet Macaw visits. Your host family, Jose and Elieth are generous and warm hosts'... Loretta and Jonathon, NY.NY. This is the most beautiful part of Costa Rica. Perfect spot for family retreat, we have had 5 Honey Moons, couples & family retreats up to 10 persons- This was originally part of a larger farm Ojo Del Agua At this point the farming operation had gone rather fallow. 1st lumber was harvested before there was a road into these parts Then at one point many trees on the coastal bluff were felled to provide a good terrain for dryland rice farming which still is practiced on the way out to Carate today. Thankfully much land is now in a variety of preserves and in the process of reforestation. Fabulous secluded beaches ,and your bed looks onto the surf,as we have built the house 50 yards from the water. From the King Bed you look out at the ocean 50 yards away. We have a wonderful staff available for clothes washing for reasonable fees. 6 burner Stove,Refer, Blender,Coffee Grinder,Ice Chest, Pots And Pans Service for 10. Dining in open area downstairs seating for 8 but we can add a table. Personal well stocked library on Natural History and Novels Maps etc. 4 Kayaks for your use $100 deposit. The house is beautiful yet Rustic, ,and rental includes a second unit (Cabin next to main house) with bath room.,All built with renewable recycled hardwoods,Extensive gardens, Beachfront, Gardens and Fruit Trees, nebed netting, On sight caretaker/cook/local guide, Kayaks, Top quality linens, Cookware, Blender, Coffee grinder, on site cook, transportation, and relaxation guaranteed, Possible childcare, laundry and tours into Corcovado etc, The house is powered by solar electricity and is built and furnished with the highest quality renewable materials, All beds have mosquito nets, fans and reading lights, This house is perfect for a family or good friends, The upstairs sleeping area is one large room, There are A Huge King Bed,2 Full / Queen beds, and 1 twin bed, We can add a Full also there is a separate cabina with 2 Queen beds.,We prefer the Hammock!! , Large DVD library and Book library,cd player and ipod connection with speakers upstairs and down. Our host family Loves kids! Beautiful location with the perfect house for a family vacation. Chris and Elaine are kind and helpful owners. Josielito and his wife Rachel are excellent cooks and truly sweet people. Surf out front and a huge yard for frisbee. Perfect spot on the Osa Peninsula. You need to bring along paper towels, dish soap, shampoo, flashlight. There were no supplies. And it’s hot. There are no ceiling fans. The little fans above the bed are helpful. You turn them on by using the center knob. And your not the only ones there. The caretaker family is there and they and their friends use the kayaks so don’t let the thumping around worry you. The electricity is only available if it’s sunny. No sun, no water. No water, no flushing the toilet. Despite the dust, heat, empty water tank, empty gas tank I would come back. I loved your house Chris. It is private and clean and perfect for a relaxing vacation. Wildlife and grounds were fabulous. Had fun in the kayaks. The views of the ever changing tides in the bay was a vacation all to it self. If you are looking for serenity and beauty this is the place. Joselito met us when we pulled in and explained everything. It was hot so we were glad there were fans by the beds. We loved sitting in the ranchero and watching the waves. The kitchen had ants so we just made sure everything was cleaned up. We understand the house is in the jungle so it wasn't a problem for us. The kitchen had everything we needed and the bed was comfortable. We saw howler monkeys and toucans. Everything about the place was absolutely perfect . We had a great time at La Quinta Sonada. It really is a special place. The caretakers were wonderful and very helpful with everything we needed. The grounds and view are both amazing and listening to the ocean roar through the night is a sound you can't get enough of. During the holiday seasons (Christmas/NY and Easter) we require a minimum of a week for reservations.